It's the end of an era that's described in Mary MacAuliffe's Twilight Of The Belle Epoque: The Paris of Picasso, Stravinsky, Proust, Renault, Marie Curie, Gertrude Stein, and Their Friends Through the Great War (wow, what a mouthful!). Remembered in hindsight as a golden age, the Belle Epoque era was a time of revolutionary artistic visions, breakthroughs in the sciences, and innovations in business, but also of conflict between the church and state, deep poverty among the poorer strata of the population, and of tensions as the Great War approached. The story of the the twilight of the Belle Epoque in Paris is told through its protagonists, including artists like Picasso and Matisse, dancers like Isadora Duncan and Nijinsky, musicians like Ravel and Debussy, designers like Paul Poiret and Coco Chanel, businessmen like Francois Coty and André Citroen, scientists like Marie and Pierre Curie, politicians like Georges Clemenaceau, soldiers like Charles De Gaulle and Dreyfus, novelists like Gertrude Stein and Marcel Proust, and many more. Each chapter covers one year from 1900 to 1918. For every year, McAuliffe recaps the most salient and important events that happened in Paris and in the lives of its most famous citizens. People come and go as their lives intertwine and come to life. That's both fascinating and confusing. On the one hand, it provides an interesting insight into a bygone era and the personalities and achievements of its protagonists. I never knew that Marie Curie and Einstein went hiking together or that a determined Charles De Gaulle had tried and, failed, so many times to escape from a prisoners' camp during the war. On the other hand, though, the fact that the protagonists continually come and go can be confusing. It feels as if, as soon as you get a glimpse of someone's life, the author has already moved onto the next subject. This, at times, creates an impression of discontinuity that is fairly frustrating. Also, because the book deals with so many characters, the author is forced to pack in more information than a casual reader can easily digest. It is quite overwhelming, which is why it's best to read just a chapter, or a few pages, at a time. Although these problems never really go away, I found that, the more I read, the less they bothered me. I really struggled to keep up with all the characters in the beginning, but as I stubbornly marched on, I became more and more engrossed in the story. And now that I've finished it, I feel the desire to read McAuliffe's previous book, Dawn of the Belle Epoque: The Paris of Monet, Zola, Bernhardt, Eiffel, Debussy, Clemenceau, and Their Friends. If you're interested in an in-depth biography of the protagonists of the Belle Epoque, this is not it. There just wouldn't be enough space to cover everything. The book is already jam packed of details and information as it is. But as an overview of this era, it's well worth a read. Despite its faults, it's a well-research, fascinating and engrossing book. 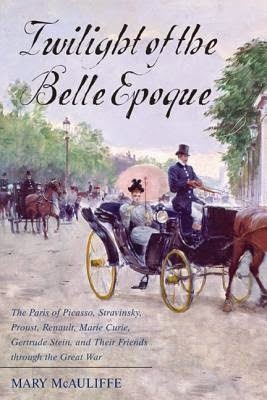 Well-written and well-researched, Twilight Of The Belle Epoque provides a fascinating insight into this era and its protagonists. However, because of how many characters, which constantly come and go, are featured, and the wealth of information it contains, the book can sometimes feel overwhelming, especially to causal readers.